1 plain bagel from Au Bon Pain, 2 tbsp of whipped cream cheese, 2 oz. smoked salmon. 4 oz of Trader Joe's orange juice. Yum, I love breakfast at lab meetings. Someone brought in a peach tart too, which looked really nice, but I was pretty full after the bagel so I passed on it. 1 chicken quesadilla with roasted peppers, onions, and three cheese blend. Baker makes fantastic chicken quesadillas. 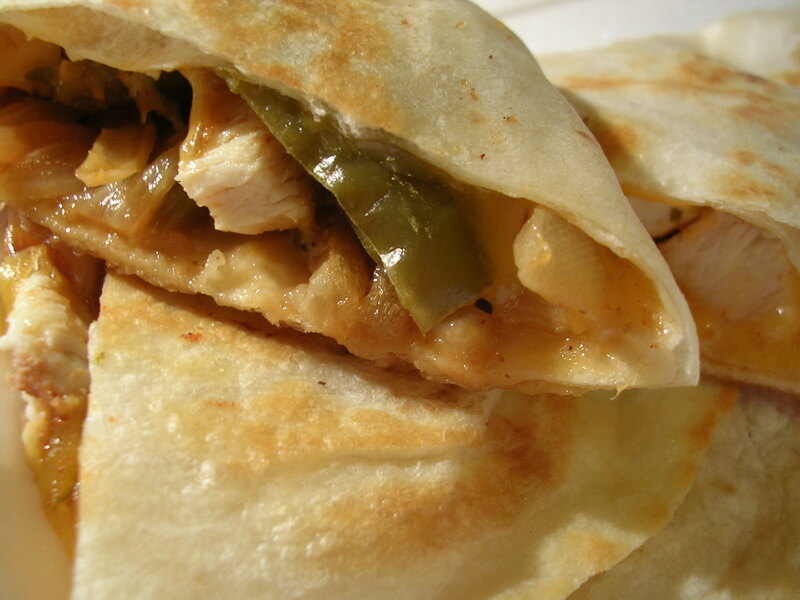 The peppers and onions make the quesadilla more moist, with yummy variety in each bite. Great comfort food. 1 freshly baked chocolate chip cookie and 1 brownie, from Shuo and Theresa Liu (they came to visit and give out food). Haha the baked good were very tasty, but probably not good for you :P I ate them while we were all chatting outside my room, sometimes you just have to sacrifice a little for socializing heh. This entry was posted on Sunday, April 15th, 2007 at 3:07 am	and posted in breakfast/brunch, desserts, Mexican, poultry, Uncategorized. You can follow any responses to this entry through the RSS 2.0 feed.